OPGC declares second interim dividend for the year 2004-05. OPGc in its recently concluded Board meeting has declared second interim dividend of 11.5% for the year 2004-05 involving dividend pay out of about Rs. 56.37 crores. The share of dividend of the Government of Odisha being the 51% stakeholder is around Rs. 28.75 crores and AES being the 49% partner gets Rs. 27.62 crores approximately. 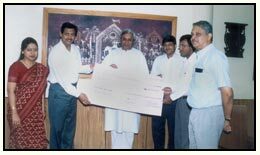 The dividend cheque was handed over to the Hon'ble Chief Minister of Odisha on 04.07.2005. The first interim dividend of 12.5% for the year 2004-05 was declared during December 2004. The total interim dividend thus declared for the year 2004-05 comes to 24% involving a total pay out of Rs. 117.66 crores out of which the state Govt. 's share for the year amounts to Rs. 60.00 crores.